According to the LA Times in 1923, it took streetcars 30 minutes to move just six blocks in downtown LA that summer. The automobile had invaded the city, and the streetcars were owned by private companies that didn’t want to spend any money on improvements. The dream? Elevating mass transit, like in the 1923 model above by Los Angeles inventor Fletcher E. Felts. One of the weirdest myths about public transit in Los Angeles is that it used to be a utopia. And you can probably guess who’s to blame. The 1988 film Who Framed Roger Rabbit? wasn’t a documentary (of course), but so many people treat it as such. People remember the film as telling the tale of LA’s “fantastic” railway system (the best in the world, allegedly) and the evil corporations that drive it out of business. In reality, the mass transit companies were all privately owned, price-gouging customers left and right, and rarely making improvements. And whenever the city approached the private rail companies to buy them out, they’d wildly overstate their worth, making it impossible for the city to make them public institutions. It’s bizarre for us to contemplate today, but when the automobile became mainstream in LA during the early 1920s, it was actually seen as the progressive transportation solution to the city’s woes. Having a car and getting the freedom to not be dependent on the schedule of the greedy railway owners and their grimy rail cars was the progressive future. But not everyone was ready to give up on rail. Inventor Fletcher E. Felts wanted to suspend railway cars above the automobile traffic and cut everybody a little slack, hopefully freeing up the roads a bit and cutting down that terrible commute downtown. 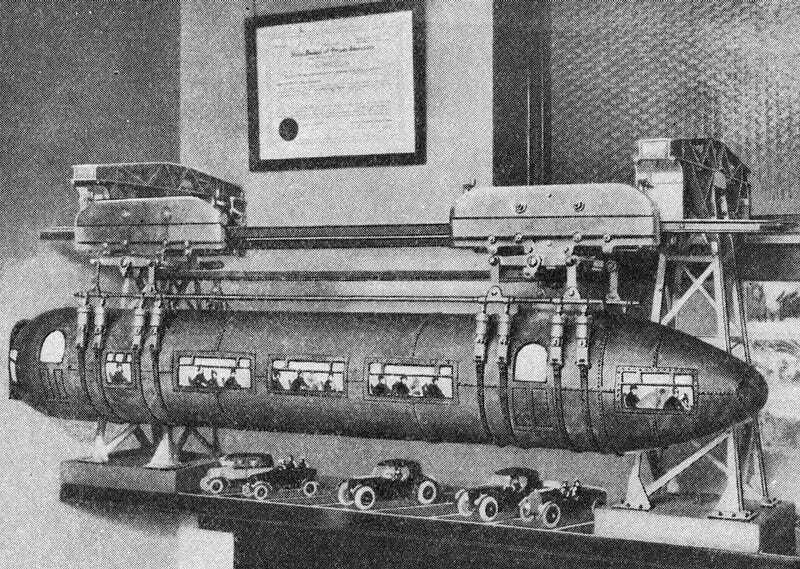 This model of a suspended overhead street railway with torpedo shaped cars was constructed by its inventor, Fletcher E. Felts, of Los Angeles, Calif., and it has been approved and recommended by the Police Department of that city, reports state. The cross-sectional view of the suspension railway shown at the right indicates how the electric motors drive the propelling wheels through gears, the suspension wheels being also the driving wheels. The main idea is to give greater street space for motor cars. As Scott L. Bottles points out in the book Los Angeles and the Automobile: The Making of the Modern City, ideas for separating public and private traffic in LA (through subways and elevated lines) date back to at least 1911. But the arrival of the automobile made the issue even more urgent. And this particular idea of Felts wouldn’t be the last. The elevated train of tomorrow would see many sketches through midcentury in Los Angeles, like the one below from 1954. Neither Felts’ idea nor the midcentury monorail you see above ever came to fruition. But with LA’s expansion of rail in the city growing with every year, it really does seem to be making up for lost time. It’s just too bad the trains don’t look nearly as chic. You win some, you lose some, I guess.